Our Cheesecakes are baked fresh daily in the store in The Hague and yes, we use 100% fresh cream cheese. Our selection includes more than 50 different flavors ranging from almost everything with chocolatey goodness, ‘adult’ flavors (yep that means alcohol) or try one of the many fruity flavors. We want every piece to look and taste like a work of art because well… we love what we do and we like to share the love. There are 3 things that count at the Cheesecake Company: passion, flavor and making people happy! Looking for the ultimate “wow” effect on your special day? Yep we can do that! We have been specializing in wedding cakes for 9 years now and know how to bring the color, flavor and smiles to your special day. We will make sure your wedding cake will be a masterpiece made with love to celebrate your love. Read more on our wedding page! Looking for the ultimate “ wow” effect on your special day? Yep we can do that! We have been specializing in Wedding cakes for 9 years now and know how to bring the color, flavor and smiles to your special day. We will make sure your wedding cake will be a masterpiece made with love to celebrate your love. Read more on our wedding page! Looking to add a unique desert to your assortiment? Or maybe just totally impress the visitors of your event? We can deliver the perfect grand dessert or sweet snack for every occasion. We have a selection of more than 50 flavors as well as cheesecakes ranging in size from bonbons to 26 cm cakes . Which means that we pretty much have something for everyone and every occasion. Curious to see what we can do for your business? Check out our business page or contact us! 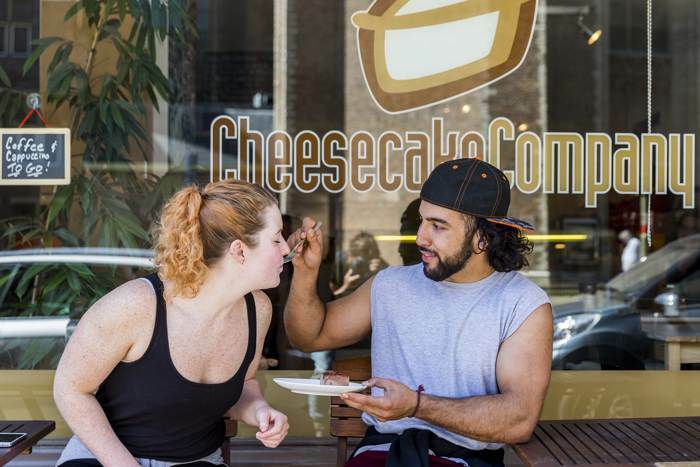 In nine years time the Cheesecake Company has grown to be a legendary shop in The Hague. Want to know how the Cheesecake Company started and why people from all over the world travel to The Hague for a piece of cake? Read all about it here. Our newest flavors are posted on Facebook and Instagram on a daily basis. We like to think of our customers as family so we often have “name it & Win” contests on our Facebook. Why? Because we love the input from our fellow cheesecake lovers. In return the players receive free cake and drinks and we get epic ideas that everyone loves. It is a win win! Which is why following us on Facebook is more than a scroll. It is an experience!